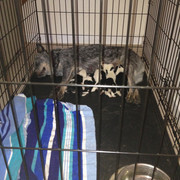 Ky hills wrote: These are Blue Heeler, Border Collie's. Born Tuesday. Congrats are you keeping them all? TC Ranch, she has 5. Skyhightree, my wife says it will be hard to part with any of them, but we are likely to only keep 1 maybe 2. Nothing prettier than a litter of puppies. I would think Kentucky must have some pastures of foals prettier.